Our Water Proofing Chemicals are supplied to many major companies across the country as we manufacture and supply best Water Proofing Chemicals that successfully accomplish their applications. The Water Proofing Chemicals are used to protect the walls in order to prevent them from leakage and damage. 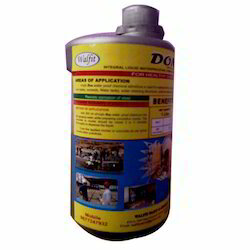 We are reckoned among our clients for offering wide array of Water Proofing Chemicals on time. Looking for Water Proofing Chemicals ?